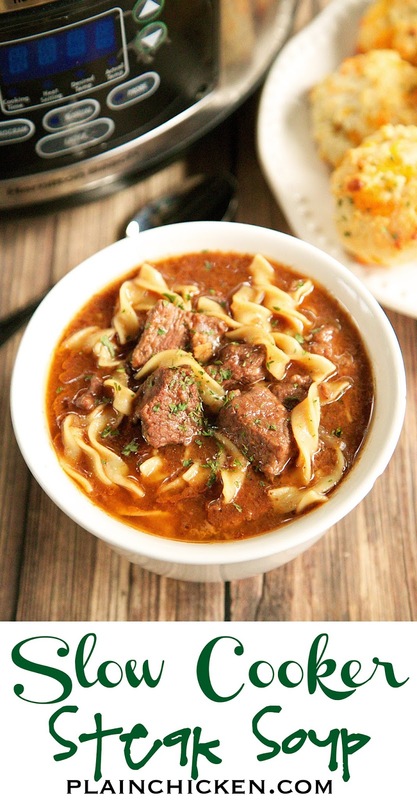 Slow Cooker Steak Soup - sirloin roast, beef broth, onion soup mix, tomato paste, Worcestershire sauce and egg noodles. 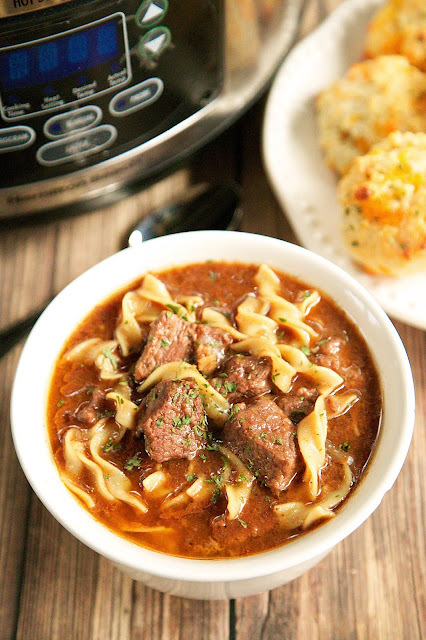 Cooks all day in the crockpot - even the noodles. Serve with some crusty bread for an easy weeknight meal! This time of year I love to have soup for dinner. Soup is easy to make and warms us up on these cool Fall nights. This Steak Soup has quickly become a new favorite. We've made it several times in the past few weeks and just can't seem to get enough of it. The soup starts with browning some chopped roast and then tossing it in the slow cooker with some beef broth, onion soup mix, tomato paste and Worcestershire sauce. About 15 minutes before you are ready to serve the soup, toss in some egg noodles and let them cook until tender. I love that the noodles cook in the slow cooker! I have an entire freezer full of beef we just got so this is happening. Like next week! YUMMY! Could you make this and then freeze it? I would suggest not putting the pasta in if you freeze this - then put then in when ready to eat. This looks like a really good soup Steph - I especially like the egg noodles in it. Thank you - this looks so good! Looks like we'll be having steak soup Friday night! This looks delicious! Do you think it would work with beef I browned the night before & put in the fridge overnight? Made this tonight for dinner and it was delicious! The only thing my brother-in-law said besides yum and this is good, was - the next time, could we make it with venison? I think I'll try that later. Thanks for a great addition to my dinner rotation. I'm tying it with venison, tonight. I'm sure it will be great. what size crockpot did you use? I used a 5qt and mine was ready in much less than 8 hours...will plan accordingly next time. What size crockpot did you use? I used a 5qt and it as ready much faster than 8hrs on low. I will adjust and give it another try. May I ask what size crockpot you used? -Also, could veggies be added into the soup. And if so, at what point? Thank you in advance. Does anyone know if they make a reduced sodium onion soup mix. This really sounds good, but the soup mix is so high in sodium. any suggestions? I wish but I think not. What could you use in place of it?? Google low sodium French onion soup and there is a great substitute recipe. I use it with Salisbury Steak recipe. My husband loves it. Try googling it. There might be a salt free version on the web. I make my own copycat mix. I haven't bought Lipton soup mix in years. Use onion powder, dehydrated onion, Knorr sodium free beef bouillon powder, celery salt to taste or not. Google copycat onion soup. Can you put cream of mushroom soup into this to make it more creamy and thick? My family wondered the same thing... I think we'll try it next time. It would be so great if you could print this recipe. I hate sitting and writing out recipes because the website does not have a print option. Every recipe has a printable recipe - just click on (Printable Recipe) above the ingredients. It even has a picture with the recipe! Why throw your flour mixture away? I would mix into the drippings from browning the meat then add the broth to it. It isn't enough flour to make it overly thick. Feel free to make the recipe to your personal preferences. Is it possible to make the same recipe in my crockpot on High for 4 hours? I haven't tried it, but it should be fine. I did, and it was fine! I put in the crock pot at 11:30 on low could it be ready at 5pm or should I put it on high for the last hour? I probably wouldn't hurt to put in on high for an hour. In the crock pot now. I used beef stew meat (they were out of top sirloin). And there wasn't much flour mix left, prob about 1/2 tsp so I just dumped it in. Looks and smells yummy, can't wait to try it! In the crock pot now. I used stew meat (they were out of sirloin) and only about 1/2 tsp of flour mixture so I just dumped it all in with the meat. Looks and smells yummy, can't wait to taste it! I don't have any tomatoe paste, is it necessary? I have everything to make this tomorrow, but the paste. I'm sure it would taste fine without the tomato paste. Enjoy! Could I use ny strip in this? I have been wanting to make this and never have the 8 hours it takes. 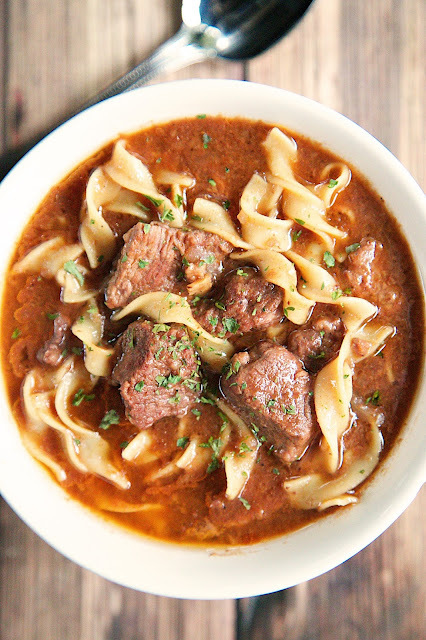 So I browned my beef tips this morning and put everything but the noodles in the crockpot. Will pop the crock in the cooker in the morning and see how it goes. Great flavor... my only critique is that the broth is VERY rich and thick. Next time I will add at least 1 cup water to it, possibly two. Tried the soup but used cream of chicken soup instead of french onion and no flour due to cream of chicken soup and it turned out really well. I added an onion and 2 garlic cloves and omitted the onion soup mix. Delicious! Can you make this without browning the steak? Trying it today with venison. Hubby cut up meat last night and put cider vinegar on to help get rid of wild taste. Smells good already. Could you use stew meat? Absolutely. I’ve used stew meat before and it is fine. Enjoy! I'm wondering if you can use potatoes instead of noodles? I don't have a crock pot. Can I make this in the oven after I brown the meat on top of the stove? I have made this twice. My 17 yr old grandson especially loves it. Use good meat if you are not cooking for long. If you go the whole 6-8 hours a cheaper cut will do. I don't onion soup because no matter what it is in, I can taste it. And if you want to try something a little different, cut a rutabaga in qtrs and throw one in for taste. I don't like rutabagas as a rule but that really gives soups and stews alot of flavor. We used little over twice the noodles (12 oz. bag), cut up beef roast into 1 inch squares and used the whole can of tomato paste (6 oz.) and it was SO GOOD.. We even tweaked it for an electric pressure cooker so it's done in an hour!!! 3. Place meat into electric pressure cooker. Add onion soup mix, beef broth, tomato paste and Worcestershire sauce. Use Stew/Meat setting and let cook for 40 minutes. 4. Add noodles, cover and cook on SLOW cook setting for 20 minutes. This was absolutely fabulous (and easy!). Definitely a do-again! How many people does this serve would you think? I am having my family over on Sunday and was thinking maybe I should double it? The ingredients, is this TWO 1/4 pound sirloin beef tip roasts? Or a single "2 and 1/4" pound sirloin beef tip roast? ok to cook for 6 hours or must it be 8? You might want to have it on high for the last hour or so, if you only cook it for 6 hours. Looks gorgeous!! What flour do you use? Plain? I made this a couple of weeks ago, but doubled the noodles, as I wanted more of a beef and noodle type meal. My husband's 2nd cousin (10 year old) is a VERY picky eater and he asked for seconds! His grandma was SHOCKED, I gave her the recipe so she would make it for him. I am making it again for supper tonight and hope to have plenty of leftovers! Can you use rib eye meat instead of sirloin tip? Can you use rib eye steak meat instead of sirloin tip? It's in the crockpot for dinner tonight. So excited to try it tonight. I had good quality stew meat so I used that. I will also add whole wheat egg noodles. Hope it turns out as good. Thanks foe sharing. So excited to try this for dinner tonight. I used good quality stew meat and will add whole wheat egg noodles. Hope it turns out as good as yours looks. Thanks for sharing. 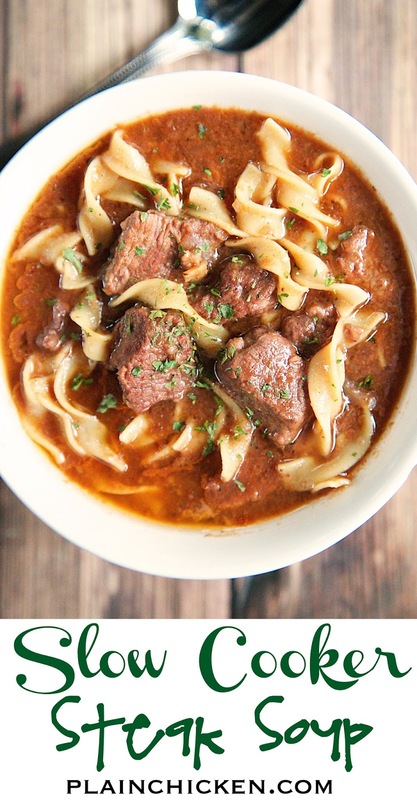 My husband doesn't eat ANY type of soup.. but loves beef tips & gravy over egg noodles. I'm going to try this to see if it could be a contender on our menu line-up! Beef stock should be just fine. Enjoy! Can this be made on the stove?? Sure. I’m not sure what the cooking time would be. You’ll just have to test the meat for tenderness. I wasn’t sure anyone in the family would like it BUT...it was a huge hit! We are not big red meat eaters but they loved it! I used a sirloin steak and a New York strip cut in cubes. Made garlic knots to go with it. Only 1 bowl leftover with 4 people eating. Thanks for a great meal! !